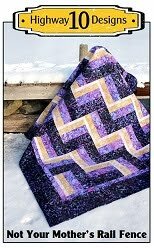 This is Marg and Barbs Midnight Sun quilt, the pattern can be found in the Nov/Dec 2008 issue of Love of Quilting magazine. I wasn’t sure who to give credit too as Barb bought the fabric to make her son this quilt and paid for the quilting but her mom Marg pieced it. Barb said she was going to get around to making it one day but her mom beat her too it. Yeah we believe you Barb! :) I have quilted one of these before, you can see Blanche’s version here. It was this quilt the sparked the idea for Barb to make it was the first quilt her son ever commented on that he liked. He was even allowed some input on the fabric as he like bold bright colors. With this pattern you end up with two quilts because of the angle you cut your strips and the color run the opposite direction giving the quilt a whole other look. So there is a second top waiting for borders so once that one is done Barbs son gets to pick which one he prefers. The quilt has Wool batting, the center is quilted with the Plush panto and I custom quilted the three borders. Straight lines in the inner border, triple loops in the middle border and Echo Curves in the outer border. I have a tutorial on how to do the Echo Curves here, you can find all my tutorials listed on my sidebar. This quilt is 98” x98” so about the same size as my ice rink now! The slush has been encroaching and this is the little bit of ice I have left. I tried to walk out a small design in our bay but the snow is so deep and there is so much slush underneath that it made it very hard to walk. So I gave up on that idea. I wanted to get a good straight on shot and use my outdoor hanging system but the only way to get a picture was to dig a path to the bench I stand on when I take these pictures. Here is my bench back in November after our first snow fall and here is it now, completely buried under snow! Definitely earned another bag of Mars Pods for that shovel task! But here are the pictures that made all the work worthwhile. 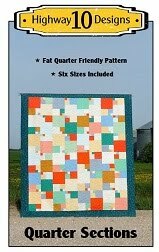 The colors in this quilt remind me of Fire and Ice! I received two lovely packages in the mail yesterday! The first one is this collection of Little Black Dress 2 that Lori and I plan on using for your next pattern design. We are busy working on our fourth pattern so I’ll be cutting into this stack of fabrics soon. Just had to tease you with that photo! The second package came all the way from Australia. Desley and I did another goodie exchange and as you can see she spoilt me again! Every January since I started blogging I like to print out my blog into book form so I have a hard copy. I use a company called Blog2Print and if you decide to use this company to make your own blog book I recommend you create your book but save it in draft form for a day or two as they will send you a 15% coupon after signing up! Here are all 5 of my books and they are a great reference to have in my Shack when I want to show a client a quilting idea that I have done in the past. Yesterday I finally got a glimpse of the rabbit that has been making tracks in my yard and he even sat still long enough for me to grab my camera and take a few pictures. He is very well camouflaged in the snow and I’m sure I have walked past him many times without seeing him! They are brownish grey in the summer and turn white in the winter. 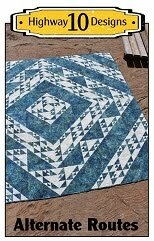 This is Kerri’s Misty Pines quilt and is a pattern found in McCalls Quilting magazine, Jan/Feb 2013 issue. The fabric is the Stonehenge Woodlands collection. Kerri wondered about vertical wavy lines for the quilting. That gave me the idea to load the quilt sideway on my machine and she left the final design up to me. This one was a bit tricky as the fabrics blend so well into each other that the quilting needed to add texture but also depth to the piecing. I wanted to add some swirls and wavy lines but was unsure how to mesh this all today. While talking to Lori she suggested I take the Angela Walters approach and start with one design, add a second element and the end with just that second design. Brilliant! So I started with the swirls at the bottom, then swirls with wavy lines ( dwirling basically) and the just wavy lines at the top. I really like the transition of this design and how it plays well with the piecing. This is Sheri’s Perfect Ten quilt and it is nice to see she is off her Hopscotch and Bali Love Song kick and is now whipping out Perfect Ten quilts like a mad woman! :) I find I am getting a bit bored with pantos so thought it was time to get back to the front of the machine and play with free hand designs. I think that will be one of my goal for this year, to work on more free hand designs as I use to do a few nice ones when I was quilting on my domestic machine. I might revisit a few old favourites and see how they look using the longarm. I guess I’ll call this one Floral Curl as I start with a curl and then echo two or three rows of petals. It’s pretty grey and dismal outside today but I wanted to share a few more pictures of the crazy amount of snow we have. It just won’t stop snowing!! This is Michele’s flannel quilt and I used the Snazzy Snowflake panto on it to keep with the winter theme. Usually these quilts are ragged on one side but she had a different plan. She pieced the top and then used long strips of the same fabric for the backing. It’s hard to see the quilting in my pictures so here is the panto I used. This is Kerri’s Swoon quilt and she made hers using a 6 blocks layout. I have seen many Swoon quilts other quilting blogs and was very happy to finally get one to quilt! Kerri asked for simple quilting and gave me list of her favourites pantos to chose from. I think Fascination was the best one as it is the largest scale design I have and it balances with the large 24” blocks. Finished piecing my Metro Hoops quilt top this morning and really like how it looks but I think the quilting will really bring it to life. 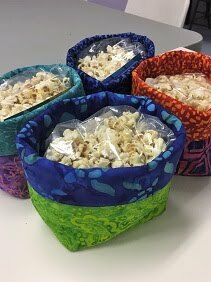 Now I just have to come up with a quilting plan! Might be a few month before I get time to quilt this one but it would be nice to have done before our guilds quilt show in April. That’s my goal. This is Melba’s Tie the Knot quilt and she used men’s neckties for the strip piecing. 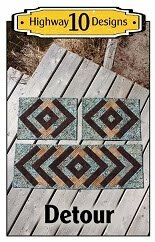 This pattern can be found in Fons & Porter’s Love of Quilting magazine Nov/Dec 2012 issue. She wanted very simple open quilting so I used Fascination for the panto design. She brought a Poly batt to keep the quilt light as the top was already quite heavy as the ties have some weight to them and are sewn onto a muslin foundation. Wednesday started out with heavy snowfall and –20’c then the wind picked up and by noon it was +1’c. The snow turned to rain for only a short time then the temperature dropped again, but the wind was crazy. As you can see my ice rink filled in with about a foot of hard packed snow. I spent the morning digging it out and I was sad to see that part of the old rink had already turned to slush near the dock. So I’m now calling it the Incredible Shrinking Rink. This is how much snow we have on the ground now! You know it’s going to be a long winter when you start measure snowfall in ‘broom handles’! I haven’t quilted one of our guilds 2009 Mystery project in awhile and the last one I found on my blog from two years ago was labelled #12. So here is #13. This is Judy’s quilt and she used beautiful shades of blue for her quilt, it is a gift for her son. She wanted simple quilting so I decided on Plush for the panto design. This is Val’s Barrels of Fun quilt and the fabric collection is called Monkey Around, it full of cute sock monkey images. 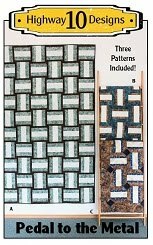 The pattern can be found in Spring/Summer 2013 issue of Simple Quilts & Sewing. I used the panto Flirtatious as they look like little bananas! Val brought a very nice chocolate Minkie Dots, the real stuff, and it worked beautifully on the back of this quilt. We have been getting a lot of snow and yesterday morning there was a break in the clouds so I quickly shovelled and swept off the rink to get a few pictures. It is now all covered up again and the forecast is for snow for the next two days. I’m been making progress on my Metro Hoops, I have 12 block made so far so over half way there! I thought this post would be a good opportunity to share this cute picture of my nephew. My friend Robin makes the cutest Sock Monkey hats and I bought one from her to give to my nephew for his first birthday. So cute!